Rattlesnakes are not only beautiful but deadly. There are 32 known species of rattlesnake that live in North and South America. Rattlesnakes are mainly associated with arid and desert rocky areas, but they can be also found in forests, prairies and swampy habitats. Rattlesnakes are very misunderstood by the general public and seen as vicious snakes that will attack unprovoked. This is simply not true. 1.) Their rattle grows continuously. New segments are added each time the snake sheds its skin (couple of times per year). 2.) Rattling sound informs predators to stay away. When rattlesnake is surprised, it can attack without producing the tell tail rattling sound. 3.) Rattlesnakes are venomous snakes. They produce very strong hemotoxic venom (which destroys blood cells and vessels). It is used for hunting and for defense against predators. 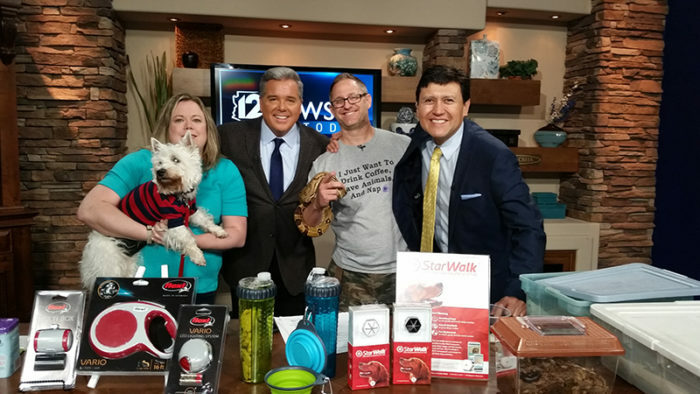 Rattlesnake bites can be fatal if not treated with antidote immediately. 4.) Rattlesnakes are carnivores (meat-eaters). They hunt rats, mice and small birds usually. 5.) Rattlesnakes have special kind of thermal receptors that are used for detection of warm-blooded creatures (their prey). They can also locate prey by using the tongue which collects scent molecules from the air. Also, rattlesnakes can sense vibrations on the ground. 6.) The common kingsnake (Lampropeltis getula), a constrictor, is immune to the venom of rattlesnakes and other vipers, and rattlesnakes form part of its natural diet. 7.) The size of a rattlesnake depends on the species. The largest species can reach length of up to 8 feet. 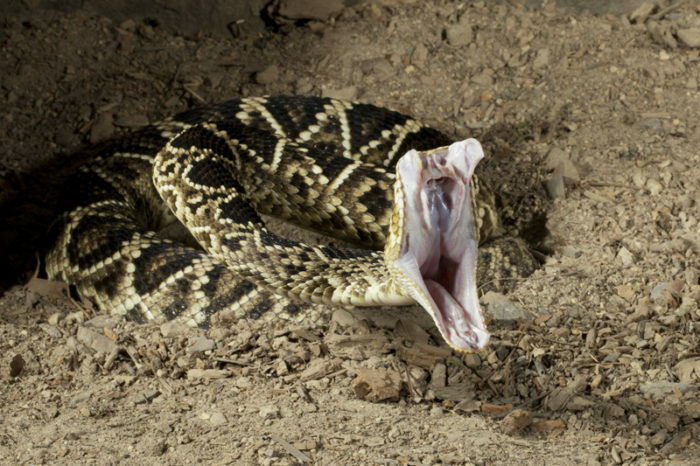 On average, rattlesnakes are 3 to 4 feet long. 8.) Rattlesnakes are not very colorful because they like to camouflage with their environment. They are usually black, brown, olive or grey in color. But some patterns are striking. Pun intended. 9.) Rattlesnakes have a triangular head and vertical pupils. 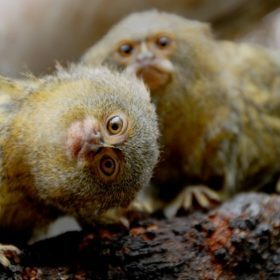 Their name comes from a rattle at the end of the tail. Rattle is made of keratin (the same substance that builds nails and hair in mammals). 10.) Rattlesnake brumate during the cold time of the year. 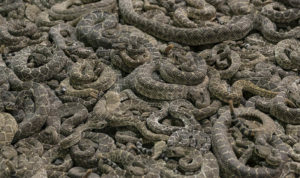 Usually large number of rattlesnakes gather in underground dens and curl around each other for the purpose of warming. 11.) 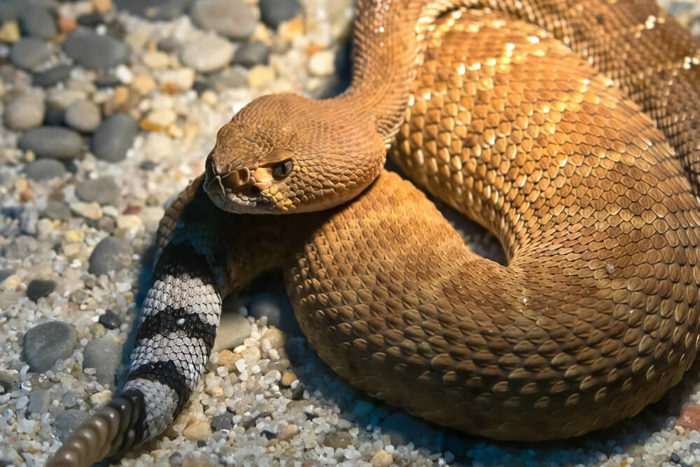 Rattlesnakes are mostly associated with arid habitats, but they can survive equally well near the water, on plains, and in forests. Rattlesnakes are also excellent swimmers. 12.) 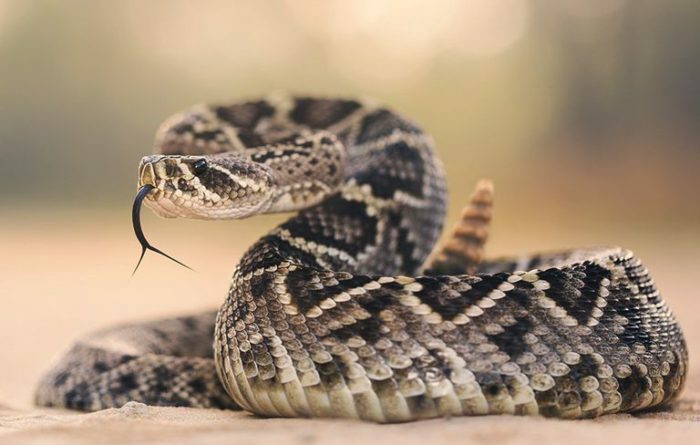 Rattlesnakes sometimes bite without releasing the venom. These types of bites are known as “dry bites”. 13.) Some snakes are immune to the venom of rattlesnakes. Thanks to that feature, king snakes are main predators of rattlesnakes. 14.) Rattles snakes alone eat a huge amount of rodents each year, helping to limit rodent caused crop damage and disease. 15.) Newborn rattlesnakes are heavily preyed upon by a variety of species, including ravens, crows, roadrunners, raccoons, opossums, skunks, coyotes, weasels, whipsnakes, kingsnakes, racers, and much more by humans. 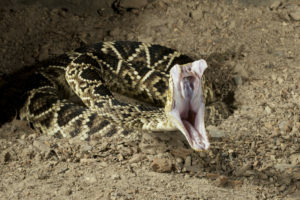 Rattlesnake venom is a mixture of five to 15 enzymes, various metal ions, biogenic amines, lipids, free amino acids, proteins, and polypeptides. It contains components designed to immobilize and disable the prey, as well as digestive enzymes which break down tissue to prepare for later ingestion. The venom is very stable, and retains its toxicity for many years in storage. A large number of rattlesnakes also die from being run over by cars.